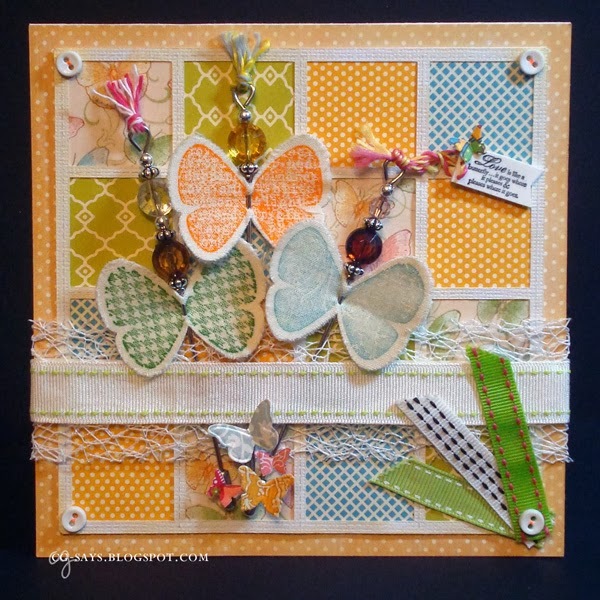 I'm pleased to be guesting designing along with the talented Crafting with Dragonflies team for their two-week Card with Stickpins + Things with Wings challenge. I made the quilted background with scraps, and placed the white frame over it. I made the overlay in SCAL and cut it on my Silhouette. I added "score lines" to give a stitched look; I inked the piece with Antique Linen distress ink to bring out the "stitching". The ribbon and twine are from my stash; in fact, those little pieces in the corner were all I had left! Glad I kept those little bits. The mesh ribbon is from May Arts. The stick pins came pre-beaded from Recollections. The tiny butterflies were cut from scrap paper using SU! 's Beautiful Wings Embosslits die. For the large butterflies, I used my sticker machine to adhere fabric to cardstock, and stamped the butterflies using dye inks. I then I punched them out with the stamp set's matching punch, both discontinued from Stampin' Up. The sentiment is from the same set; I stamped it onto a scrap of Shrinky Dink plastic, cut it into a banner shape and punched some holes, and then shrank it in my toaster oven. Update: This got a Top 3 spot at Jo's Scrap Shack. Wow, all that work surely paid off! How fabulous. Congratulations on your GDT post and welcome! Your stick pins look amazing -so long. Mine were much shorter. Cg - this is fabulous. Those butterflies are so delightful in those fresh colors. Wow! This card is absolutely stunning! And what a clever way to incorporate stick pins! So many lovely things to look at here and I adore the color scheme and patterns you chose. I also like how the background looks almost like a window that the butterflies are flying past. The lace and ribbon and buttons are a great dimensional touch and the whole thing made me smile and think of Spring (even though I am huddled up with a quilt at the moment to stay warm)! 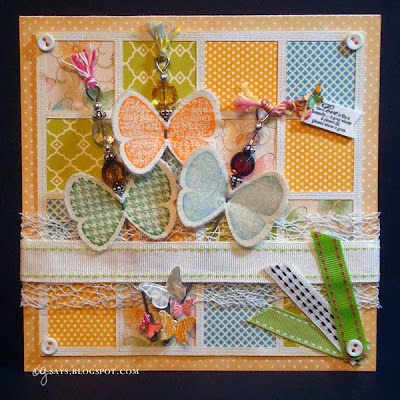 I'm so glad you shared your talents with us here at the Simon Says Stamp Monday Challenge blog! This is stunning. You have done a lovely job. Love everything about it. What a stunning card.....so much to look at. Glad you're enjoying being guest designer with us at dragonflies. Oh this is absolutely gorgeous!!! I love all the beautiful colors, the butterflies, lace, stickpins... just beautiful! Thank you so much for joining us this week at Jo's Scrap Shack for our FFC "Things with Wings"
What a GREAT way to use your scraps!!! And what a GREAT way to use your stick pins. Thanks for joining us this week at Hiding In My Craft Room for Super Scraps Saturday! Hope to see you next week .....and Good Luck!!! This is Beautiful!!! Love this! :o) Great Work!.. Love your idea.. and this is Scrapping!.. Beautiful!! !